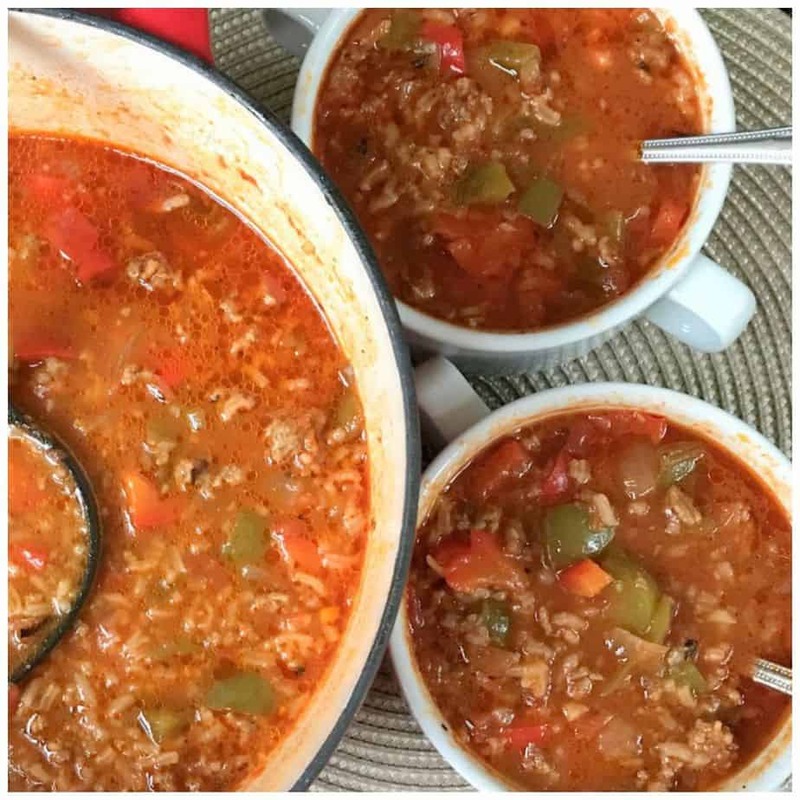 This 30 Minute Stuffed Pepper Soup has the same awesome flavors of stuffed peppers with less work. Just think of it as deconstructed stuffed peppers. Wow school is going to start in just a couple of weeks and things will start to fly very quickly. Before I know it my life will be total mayhem and the slow somewhat leisurely pace of summer will be behind me. Shortly after that fall will start to appear. It is by far my favorite time of the year. 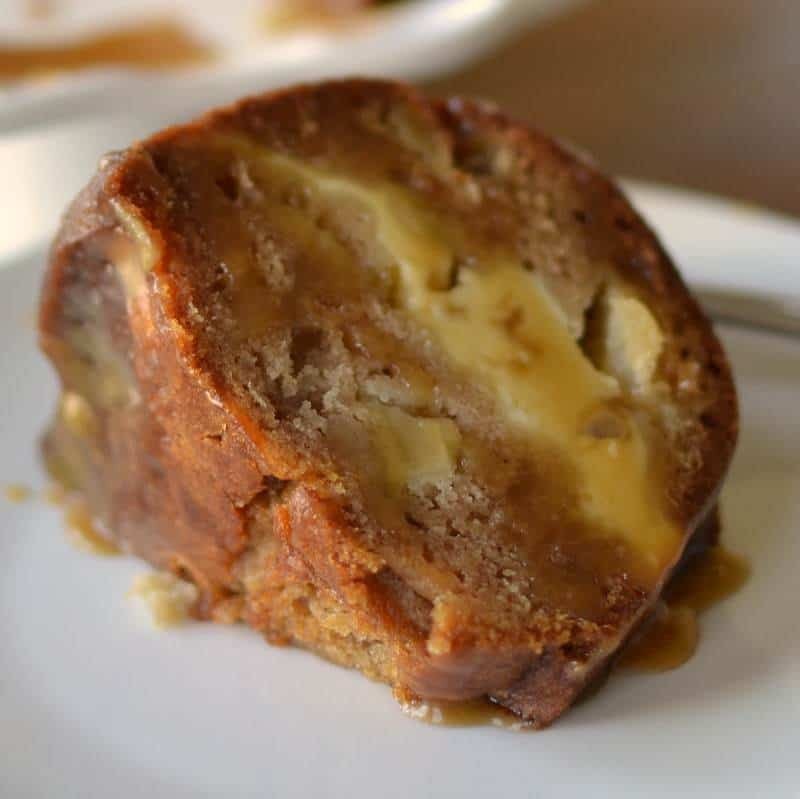 Not only do you get the beauty of the season with the amazing color of the leaves falling from deciduous trees and vibrant blooming mums but you get some of the most delectable comfort recipes ever. I should have been born in October, married in October and had all of my children in October. To me my idea of heaven is an endless October. Do you see a pattern here? LOL It is just about for soup weather. Of course I think anytime is great soup time. 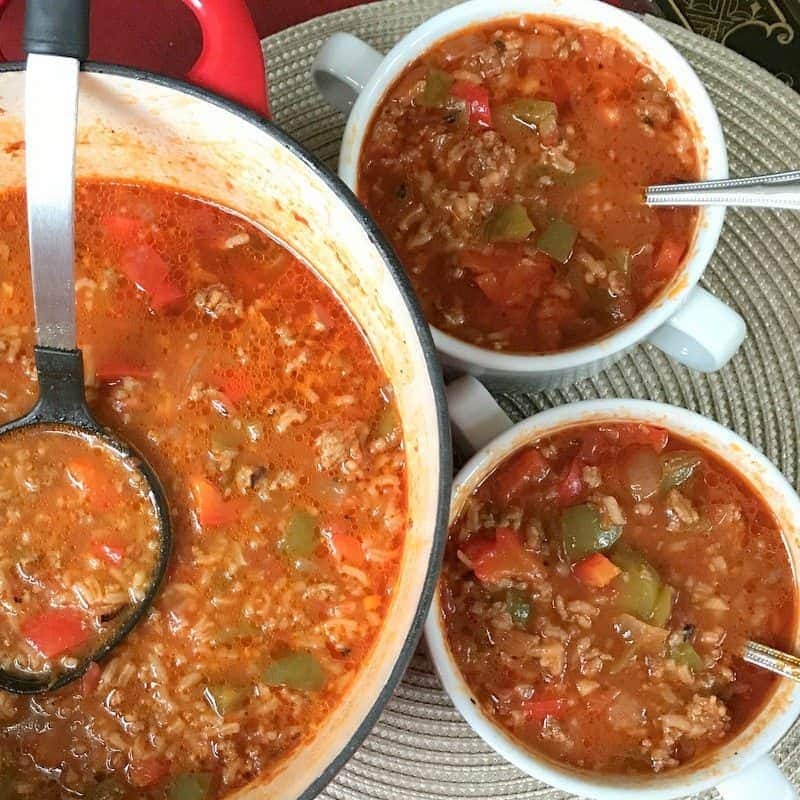 This 30 Minute Stuffed Pepper Soup has the same awesome flavors of stuffed peppers with less work. Just think of it as deconstructed stuffed peppers in soup form. 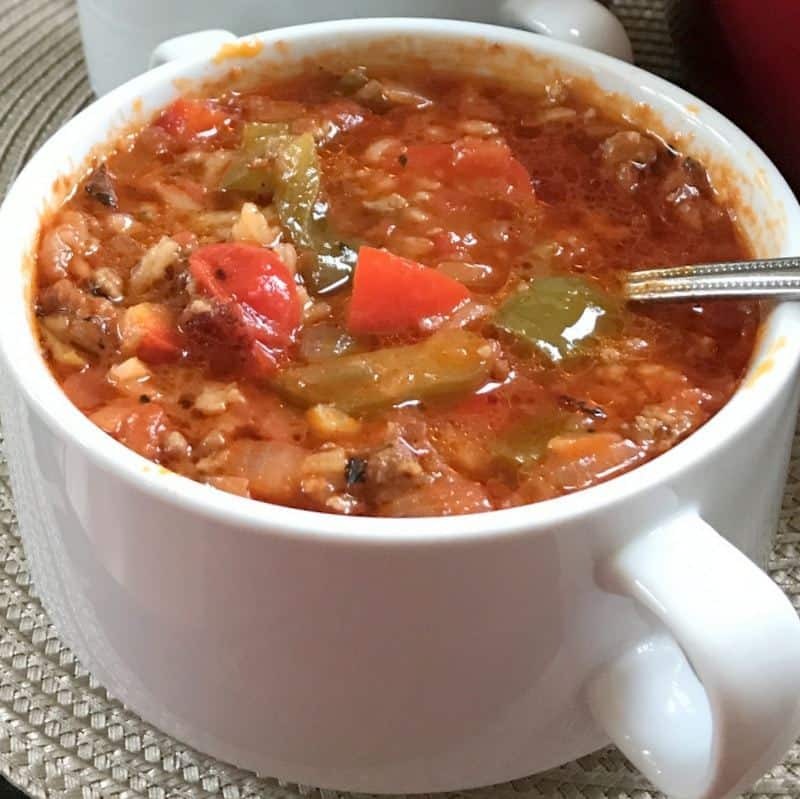 30 Minute Stuffed Pepper Soup is so quick to come together and it is one of those recipes that you can cut and prep as you go. It does not require much simmer time but feel free to if you are busy with something else although your peppers will get pretty soft. It is perfect for a weeknight meal and is enjoyed by my whole family. 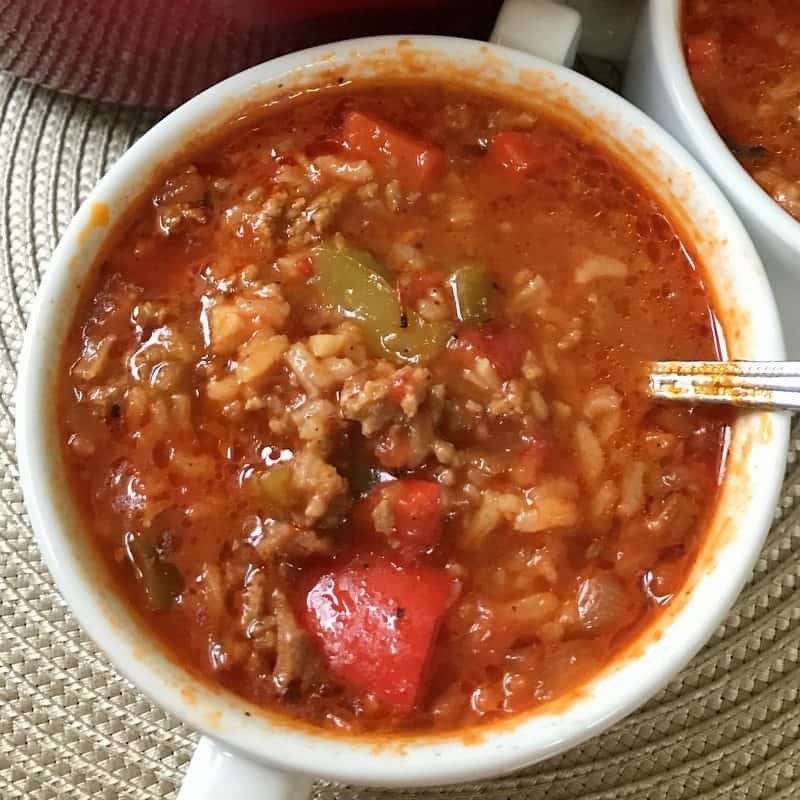 30 Minute Stuffed Pepper Soup is quick, dependable and tasty. Put the ingredients on your list this week. Fall will be approaching before you know it and you will want to have all of your favorites in order. Other soup recipes you will love! In dutch oven or heavy stock pot brown sausage and ground beef, When almost completely browned add onion and peppers. Cook for an additional 2-3 minutes. Add garlic and cook for 1 minute. Drain any excess grease. Add beef broth, chicken broth and salsa style tomatoes. Bring to a low boil. Add rice, cover and cook until tender approximately 12-15 minutes. You can top with grated cheddar and green onions if desired. 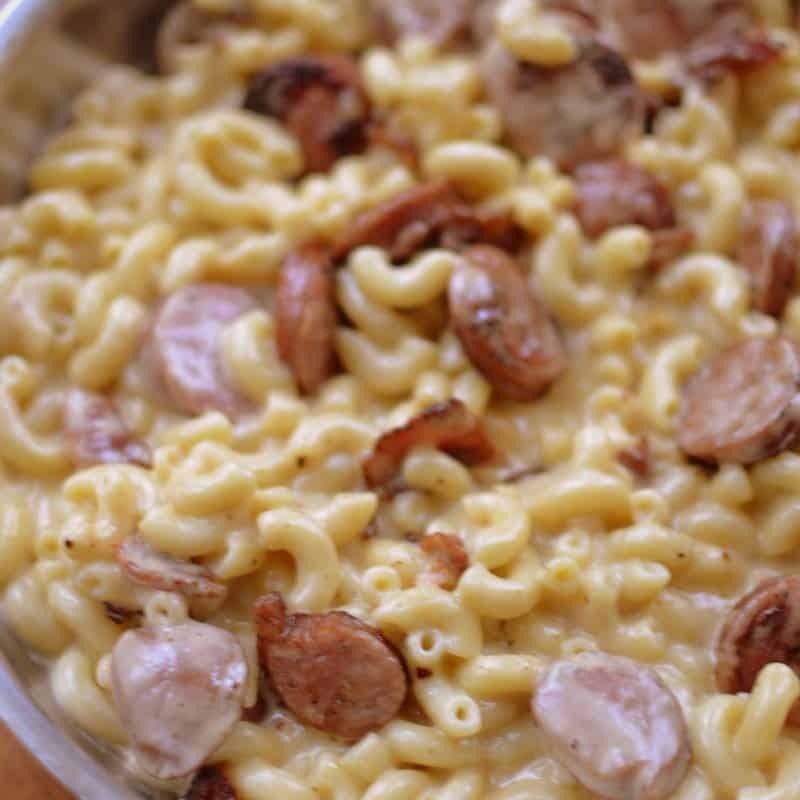 Other delicious comfort food recipes you will love! What exactly do you mean bu salsa type tomatoes? Diced tomatoes with green chiles? Or what? Thanks! Not all stores are organised the same way… mine has salsa tomatoes with the fixings for Mexican food, regular canned tomatoes are with the pasta. Understood. Thanks for the heads up. We added some Italian seasoning w/ a regular can of diced tomatoes., but we guess you could add some Mexican seasonings like chili powder, cilantro and cilantro if using the salsa-style tomatoes. It just needs some spices. Thanks for the heads up. My salsa style tomatoes have a lot of spices in them. This sounds so yummy. Soon will be soup weather. So true! Of course we enjoy soup year round but fall is just around the corner. There was something missing from this. I did add some Italian spice and hot pepper flakes. It just seemed thin to me. I added a 15oz can of tomato sauce which thickened it. Fantastic! Can this soup be canned? If so any idea what pressure and how long? Trying to stock up before winter hits. I am not sure I have never tried. Perhaps one of the readers can answer that. I would say that this makes about 10-12 cups of soup which in our house probably translates to six bowls. I hope this helps. I can cook but I am terrible at judging quantities. I’m wondering if this could be done in slow cooker and instead of quick rice could regular long grain be the same? Other than the cook time needing adjustments? I am not sure. I have not tried. You would have to brown your meat separately. I am unsure of cooking time however I think it could work. Great! I hope you all enjoy it! I love stuffed pepper soup! !